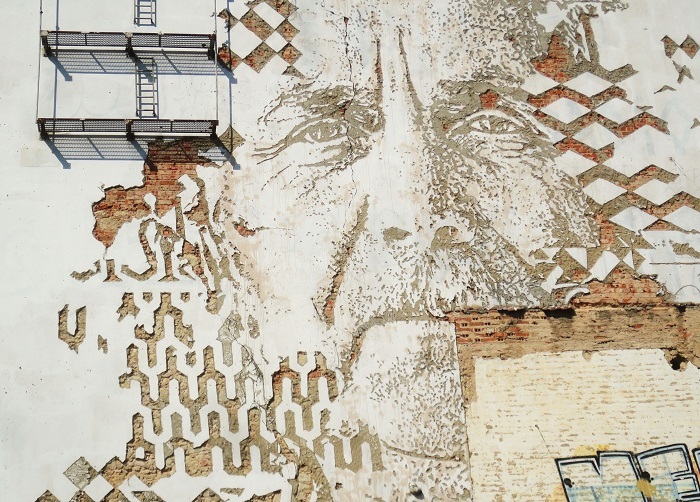 What a fascinating mural, seamlessly incorporated into the decaying facade of the abandoned building. The artwork is incredible! Stunning, even. I hope Alexandre Farto gets his work shown in other, more "normal" venues. This is wonderful. I love the way it just melts into the building. Like this portrait. Works for me. Al kinds of technics used here inclusive the removing of the plaster. Very nice one. What a magnificent mural, Jose, and a terrific capture! I really like the way he's incorporated the texture of the old building!! Superb! Hope you have a great new week!! A fascinating and BIG mural ! This is worthy of a quadruple-take, excellent mural and photo! I am fascinated by the bridge in the background. The left side looks old and the right side looks new. That is a pretty cool mural. Love it. Even from the thumbnail I recognized this a Vhils, who you introduced me to. Another amazing work. Thanks for contributing to this week's Monday Mural. That is a stunning mural. I really like the combination of the two photos. It provides context. The second one has a wonderful juxtaposition of images, even the truck in the background. What's that high in Lisbon, the approach to the Tagus bridge? That is so unique! A very modern and inventive interpretation of bas-relief. @Bob Crowe: Yes, it's the 25th of April Bridge which connects Lisbon to the south bank of the Tagus River. I like his work, always interesting! Thanks for the link. I was captivated and fascinated by the video entitled "Incision". I got a great sense of both the physical process and the vision driving this extraordinary artist. 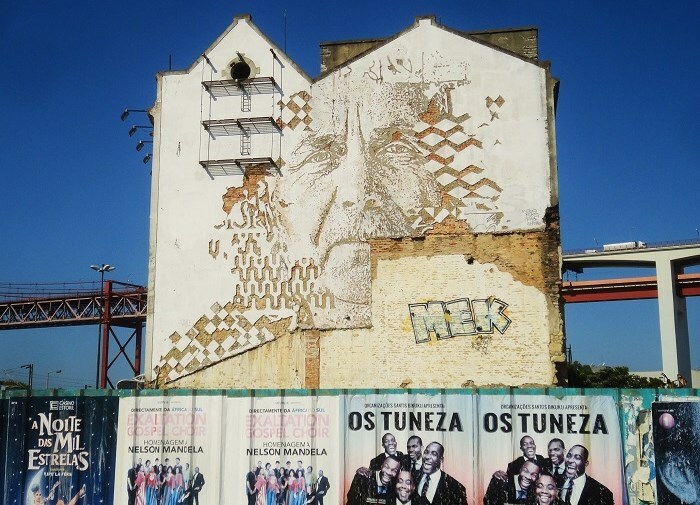 On you know I just love Vhils Jose, what a super special find. Beautiful reflections . and indeed I love the whole post Have a lovely weekend. Excellent! Wonderful mural by a talented artist.